Gina Haspel, the Director of CIA will brief this Tuesday leaders of the Senate about the death of Saudi journalist and The Washington Post contributor Jamal Khashoggi in a closed session after the White House last week barred her agency from attending a briefing about relations between the US and Saudi Arabia. Reuters, citing two sources familiar with the planned session, said Haspel will brief the Republican and Democrat leaders of the Senate Foreign Relations, Armed Services and Appropriations committees. 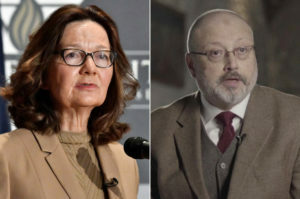 Haspel’s scheduled appearance according to the news agency has been requested by some members of the Senate who last week did not approve the absence of the CIA during a briefing by Secretary of State Mike Pompeo and defense Secretary Jim Mattis. The CIA has assessed tapes recording of Khashoggi’s killing in the Saudi consulate in Istanbul on Oct.02. The agency, according to the Washington Post and many other media, has identified the Saudi Crown Prince and White House ally Mohamed bin Salman as the orchestrator of the journalist’s assassination. The agency’s conclusion has been rejected by President Donald Trump’s administration, which says the tapes do not show strong evidences against the 33-year old Saudi powerful de facto ruler. Ahead of the Tuesday briefing, Haspel had reportedly appeared before the Senate Intelligence Committee.